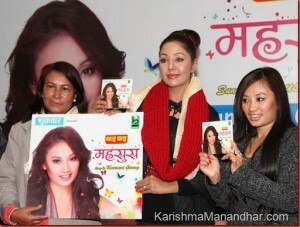 Singer Mausami Gurung has recently released her latest album, Mahasush on November 8, 2011,in a program held in Kathmandu. 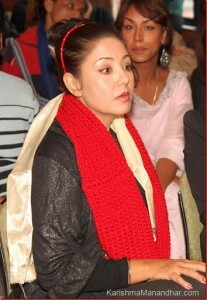 Present in the ceremony with Karishma Manandhar were singer Kunti Moktan, song wrier Rajendra Thapa, and singer Om Bikram Bista. The album features 9 songs written by various lyricists inculding Anushil Shrestha, Anil Staphit, Sohan Manandhar, Madan GC, Upendra Subba and Suman Lama. The music of various songs are composed by Furba Sherpa, Binod Khumbu, Kalyan Singh, Jems Pradhan, Sohan Manandhar, Om Prakash Rai, Sugam Pokharel, and Susan Lama.